Cathy Bates founded Practical Solutions in 2003 out of a desire to help others organize and downsize their homes, offices and lives so they could make time for what matters most. As a busy professional, mom, wife, and caretaker for aging parents, she knows the daily struggles her clients face, as well as the positive impact an organized environment can have on their home, family, business, and life. 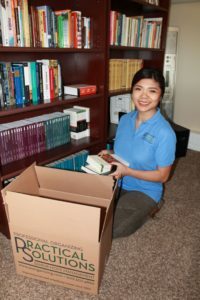 ​Practical Solutions offers hands-on de-cluttering services that are customized to fit the client’s individual needs. Although clients may have failed time and time again in the past to stay organized, with the help of a competent, non-judgmental third party as their guide, they can be successful in clearing the clutter for good. Based on an initial consultation session, the client will be matched with an organizing consultant whose personality and skills are complementary to their own. In addition to organizing and de-cluttering, the Practical Solutions team also helps seniors downsize and relocate to new homes that fit their changing lifestyles. So whether clients are moving, starting a new life phase, or downsizing after the loss of a loved one, the team makes the transition easier and less stressful. All of Practical Solutions' consultants share Cathy’s passion to help others regain control of their surroundings and life. They are compassionate, trustworthy, patient, and respectful. They highly value their clients' privacy, and keep all client information strictly confidential. Practical Solutions' overarching goal is to help clients simplify and stop focusing on things so they can get back to spending time on the people and activities that mean the most to them, and enjoying life to the fullest. Practical Solutions also believes in giving back to the community at large. That's why more than 20 percent of the team's time and profits go back into making the community a better place to live. If you have been watching Tidying Up on Netflix and are ready to tackle your own house but don’t know where to begin. We can help! Our team of organizers are familiar with the KonMari Method developed by Marie Kondo and can help walk you through the process. Best of all, we promise not to pile your clothes on the bed and leave you with no place to sleep. We will be with you every step of the way.